Hanna Makhmalbaf is the daughter of Mohsen Makhmalbaf, the famous Iranian film director and an ardent revolutionary in his youth. So much so that during the Shah's rule, by the time Mohsen Makhmalbaf was 15, he had formed his own Islamic militia group and by the age of 17 he was shot and arrested while trying to disarm a policeman. Neither Mohsen Makhmalbaf nor his daughter Hanna now support what is going on in Iran. 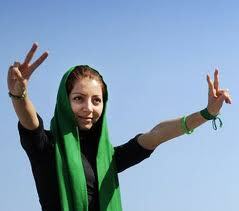 In fact they both now back the Green Movement and desire a democratic change in Iran like most Iranians do. Having had the experience of living in a religious state, Hanna hopes her experience will alert the people of Lebanon ahead of Ahmadinejad's imminent visit to Lebanon. Her address to the people of Lebanon comes after the Lebanese authorities decided to stop the showing of her award winning film, Green Days, ahead of Ahmadinejad's visit, during the Beirut International Film Festival, so as not to upset the Iranian dictator who has promised a half billion Dollar loan to Lebanon. "I was happy to think that by watching the film Green Days, you will see a realistic tale of Iran's elections. A green election which the Iranian regime turned into blood red after they killed tens and arrested thousands. News reached me that some of the officials in the art of politics and expediency in your country, under the excuse of not upsetting Ahmadinejad before he enters Lebanon, have prevented the showing of Green Days in the Beirut Film Festival. I wish I could come to each one of your houses with that movie so we could watch together the moment Nedas died. Then my broken heart would ask your tearful eyes, my dear Lebanese, how could he who extinguished the Nedas of his own land not extinguish your Nedas of Lebanon? Ahmadinejad stole our votes yesterday and will steal your trust today. His intention is not to help you, just as his intention is not to serve Iran. His firebrand cries of justice to Iranians has brought nothing but poverty, imprisonment and torture under the name of God and his rabble rousing against Israel is nothing but a public deception of the Islamic world and will bring nothing for your land other than war. He uses your land as a frontline trench of his imaginary war. His insignificant loan is like the blood money for the great spirit of the youth of your country. Ahmadinejad in my land is the symbol of censorship. Look how he brings censorship to your country before even arriving there. Ahmadinejad and Khamaenii begin with the name of God but only end in the interests of Satan"
well written letter but there's no hope in Lebanon since Hezballah controls that country completely. "Ahmadinejad stole our votes yesterday"
Same thing would have been true if that scumbag Mousavi had won. What part of this don't these reformist morons understand: with a Guardian Council and Supreme Leader, whatever the outcome this election would have been unfair and undemocratic. Ahmadinejad is not a "symbol of censorship", the ISLAMIC REPUBLIC is a symbol of censorship and fascism. This reformist tool would have us believe that everything would be rosy if Mousavi had "won". This is a LIE and detracts from the main aim which should be regime change. Although I agree that the film should definitely be shown as scheduled and respect artistic expression, the term "imaginary war" is both offensive and untrue. You don't have to agree with Ahmadinejad's involvement in foreign wars (i.e. between Israel and Lebanon), but claiming that those wars don't exist at all is absurd. Ahmadinejad did not create Lebanese resistance, Israel did. She hits the nail right on the head. But of course is told to hush up during the blood money gun-runner's visit! I do grudgingly agree with Arash's sentiments. Mousavi is an equal product of the Islamic Republic, but perhaps he would've proved to be a Gorbachav to bridge the transition to a more open Iranian society! I'm not saying that would've happened. But ultimately it's all academic now. When the inevitable change comes, I think it's now obvious that it will be an implosion of the regime coupled with a violent explosion of the people! I just hope that in the next up-coming revolution, it doesn't let in yet another future tyranny through the back door! Don't think anyone is a Gorbachev figure in this regime...that's the same mistake the Americans made when Rafsanjani came to power. There are no moderates amongst terrorists and fascists. This regime is a religious mafia and needs to go, full stop. Sadly you're probably right my friend. But equally sadly, there doesn't seem to be any real figure head that can powerfully mobilize the people and take on the regime with some secular and democratic clout. Unless you can think of anyone..?